You would have no doubt come across the “B2B” keyword being thrown about in the course of your wholesale or distribution business. And you might have shelved the thought of dipping your toes in it because of the perceived cost and complexity in implementing a B2B eCommerce platform. Besides, your suppliers are chasing you for overdue invoices and you’ve got crates of fast-ripening organic fruits and vegetables that were supposed to have been delivered yesterday to your retailers. You simply have no time to try this B2B thing. 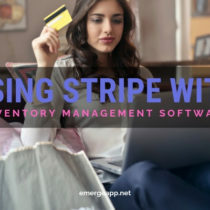 Well, you’re in luck if you’re using an order, purchase, and inventory management software called EMERGE App. This cloud-based web application includes a simple B2B eCommerce platform for free with every account. Yes, that’s right, for free! Hold On, What’s B2B Again? Just to recap, what exactly is B2B? Well, as opposed to something like an online shopping site for consumers, B2B means business-to-business. This means you, the wholesaler or distributor, selling to your customers (the retailers). Think of it as automating your customers’ purchases from you. So, instead of them calling, emailing, messaging or faxing (do people still use these?) their orders to you, they simply login to a personalized purchasing account, select their goods and then checkout with a shopping cart. 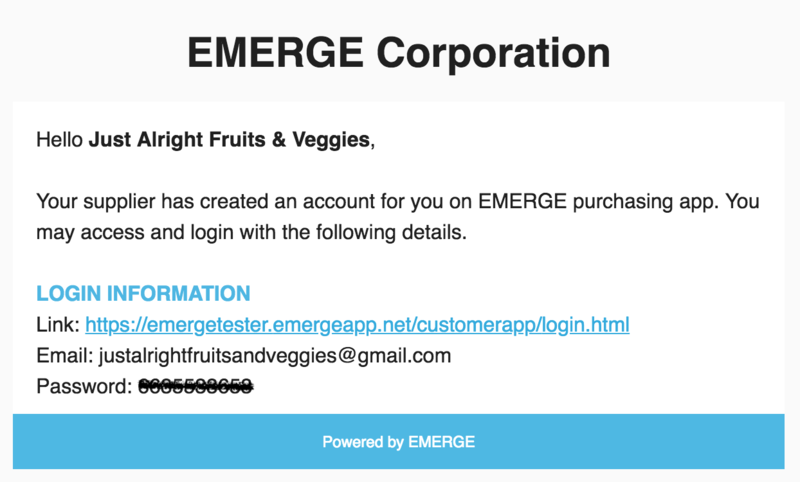 Your customers get the flexibility of purchasing from you 24/7 and you get the convenience seeing their purchases automatically entered as sales orders in EMERGE App. Plus, your customers don’t need to deal with a human. Data entry errors and mistakes are minimised and — best of all — there’s no paper involved! No cost to try. It comes free with EMERGE App — for now. Easy to use. It shares the same user-friendly, web-based interface as EMERGE App. Fast to implement. Since it is part of a web application, there’s no desktop software to install or complicated servers to set up. Customisable. You control what products and prices each customer sees. Create seasonal and promotional catalogues on the fly. Shopping cart workflow. Your customers already know how to browse, add and checkout with online shopping carts. What are you waiting for? You have nothing to lose, except for a couple of organic apples perhaps. 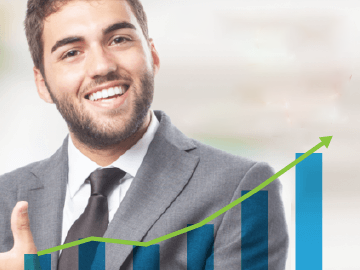 So, let’s get started on how you can make B2B eCommerce work for you right now. 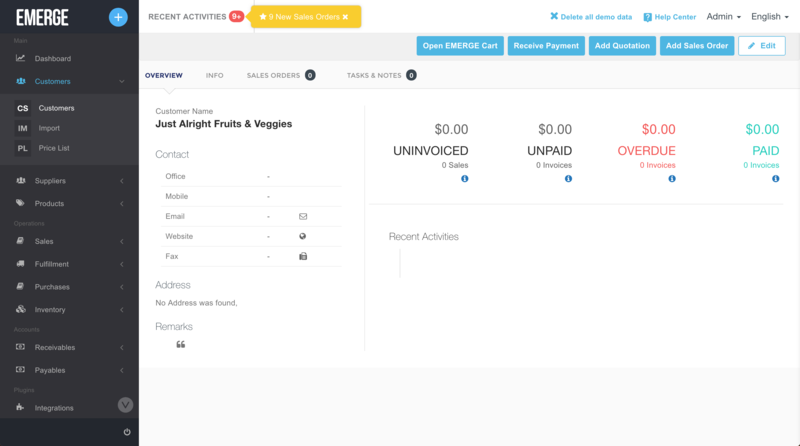 I’m going to show you the entire workflow with EMERGE Cart, from setting up purchasing accounts for your customers to receiving their orders in EMERGE App. Let’s imagine for a second that you’re running a wholesale business for organic fruits and vegetables. You buy rare heirloom varieties from small-scale farmers. You sell them to your customers: whole-food retailers and mom-and-pop grocery stores around the city. Firstly, let’s start by picking a favourite customer of yours that you wish to open a purchasing account for. 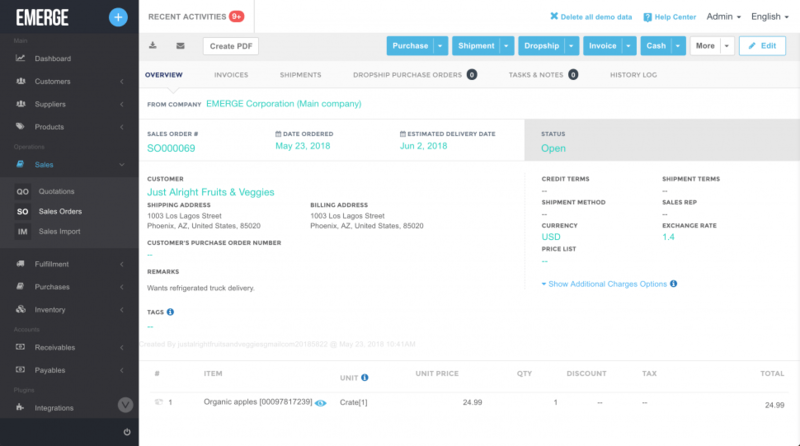 Click on the customer of your choice in the Customers module and then click on Open EMERGE Cart to start the account opening process. Here, we’ll pick Just Alright Fruits & Veggies, a new retailer run by savvy tech types who are kale juice converts. You’ll be prompted to enter your customer’s email address. In the background, a welcome email along with their login details and password will be emailed to them. We’ll take a look at the actual email later on. Next, select the categories and products that you wish the customer to see. This is useful if you’re a wholesaler or distributor dealing with diverse products from foodstuffs to clothing and electronics. Otherwise, if you’re dealing solely with one product range, such as baking goods, you will no doubt have multiple complementary categories, such as Baking Yeast, Flour, Sugar, Dried Fruits, Nuts, and so on. If you have a ton of products, you can search and add by their name and code if you want. Don’t worry, you don’t have to get the catalogue absolutely right the first time. 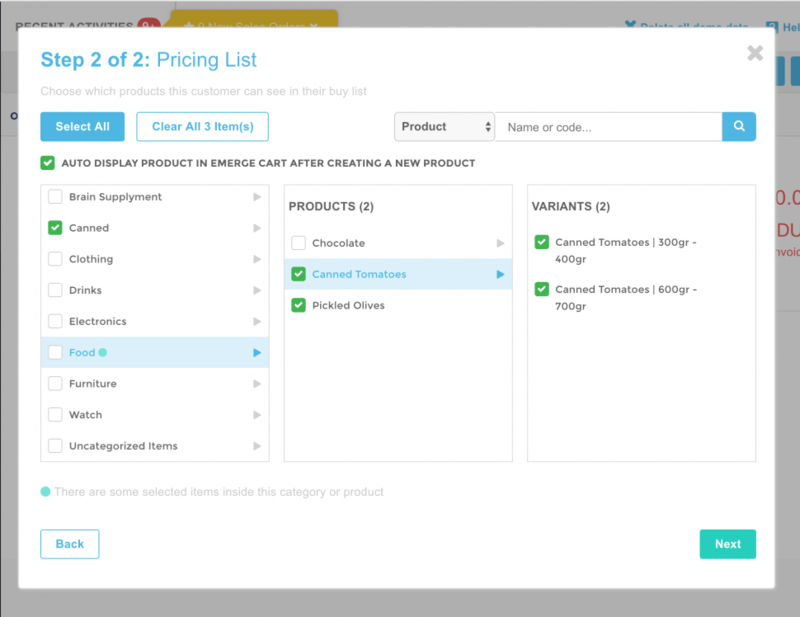 You can always edit the products and categories later to suit your customers or changes in your products and pricing. In the second part of setting up the account, you can pick a price list for the customer if you wish. You might want to welcome new customers with special discounted prices just for their eyes only. But, really, you just want to move those crates of fast ripening organic bananas! So you’re slashing prices on them to move them quickly. Here, we’re applying a custom summer price list with a 20% discount off selected fruits to show that you’re a nice wholesaler. And that you really want their repeat business, preferably with B2B! Again, you can always come back to apply a custom price list anytime your promotions change. 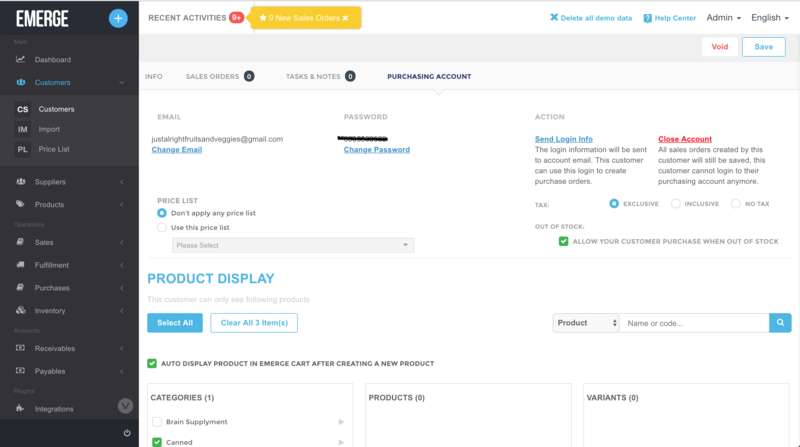 Once everything is set up, you’ll come to a newly created Purchasing Account dashboard for the customer. 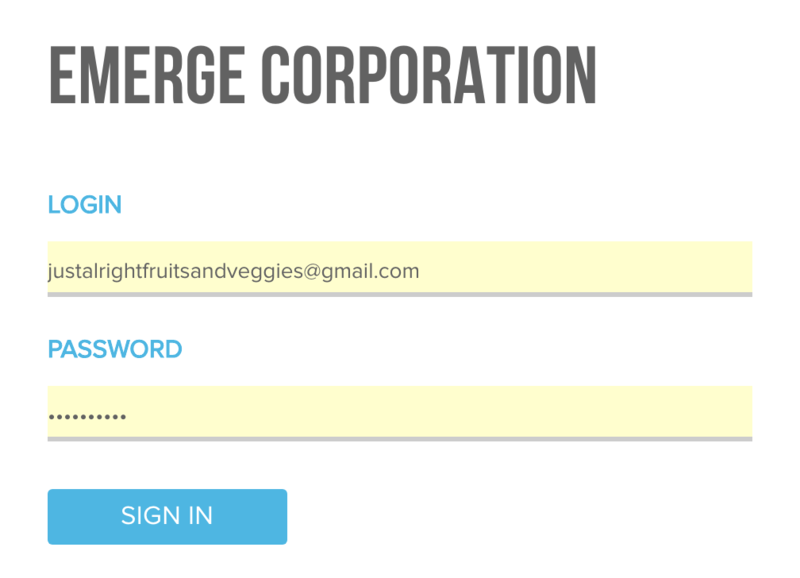 Here, you can do administrative things like changing their email address and password. Or to send their login info to them or, gulp, close their account if they really want to. 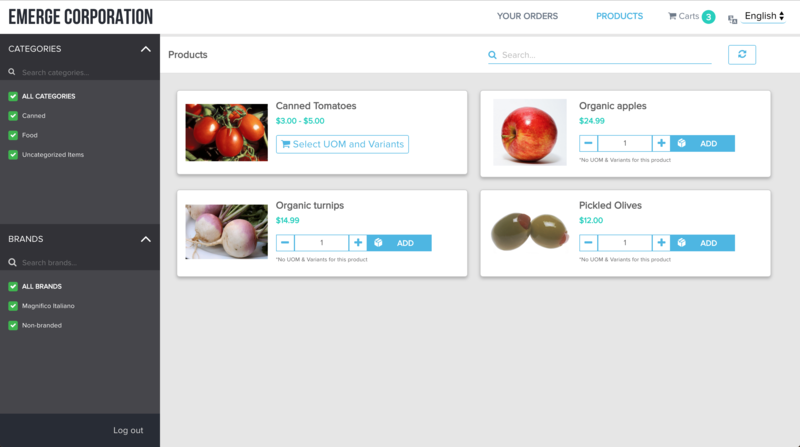 The dashboard will also allow you to change or edit the products and price list for the customer. Here’s a power-user tip: if you’re dealing with fast-moving products and prices, any changes made in EMERGE App will be reflected in EMERGE Cart in real time. So you can be assured that your customers are looking at real-time prices and products that are available for purchase right now. Rinse and repeat this procedure for each customer that you wish to open a purchasing account for. Now, let’s hop over to Just Alright Fruit & Veggies and see EMERGE Cart from their point of view. 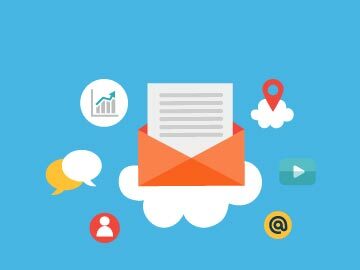 Your customer would have received a nice welcome email along with a link and login details. Just Alright only needs to click on the link to visit the following login screen. They will enter their email address and password from the email and click Sign In to login to their personal purchasing account. Once in, Just Alright will see a personalised product catalogue that you curated just for them. You still have crates of ripening fruits leftover from your recent spring season sale. You really want to move them quickly, so you’re offering them for 20% off for this customer. Just Alright will no doubt be familiar with the shopping cart metaphor. They will select the quantity of products that they’re interested in and add them to the cart. Once done browsing, it’s time for them to checkout by clicking on the shopping cart. Like any eCommerce site, Just Alright will be presented with a summary of their chosen products and their quantity in the shopping cart. They can alter the quantity or remove the product entirely from the cart if they change their mind. In addition, they get to select the shipping address and any additional charges, including shipping and freight. They can also add more information useful to them, such as a reference number or remarks for you. 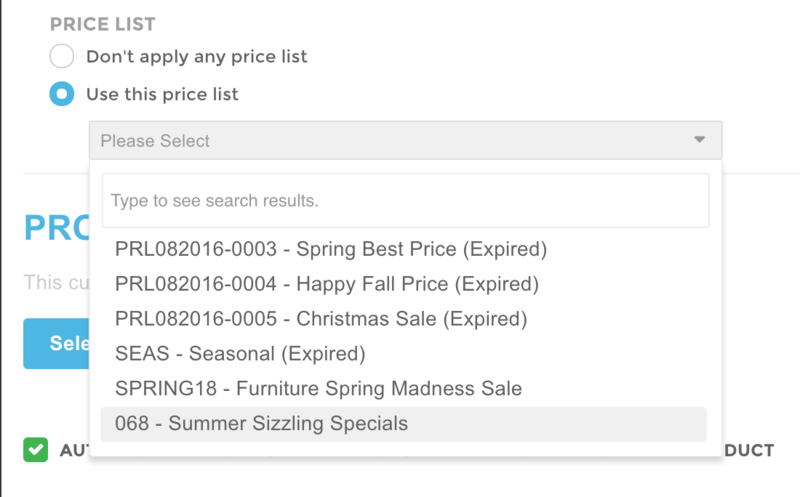 Everything in the shopping cart is tabulated and the total figure is presented under the item list. Just Alright will click on the Check Out button to complete the B2B purchasing experience. 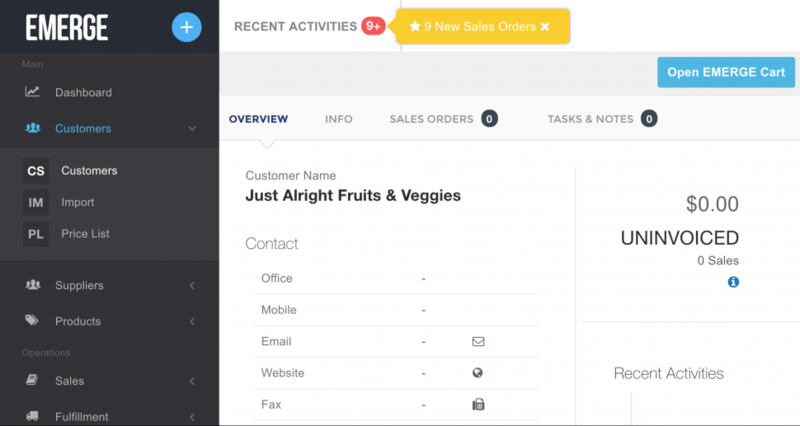 Can customers check on their purchase order history? They sure can! Just click on Your Orders to see all their orders to date. Better still, they can conveniently download their sales order in PDF format by clicking on View PDF. This is a pre-formatted sales order that summarises their purchase. How cool is that?! Finally, we saved the best bit for last. 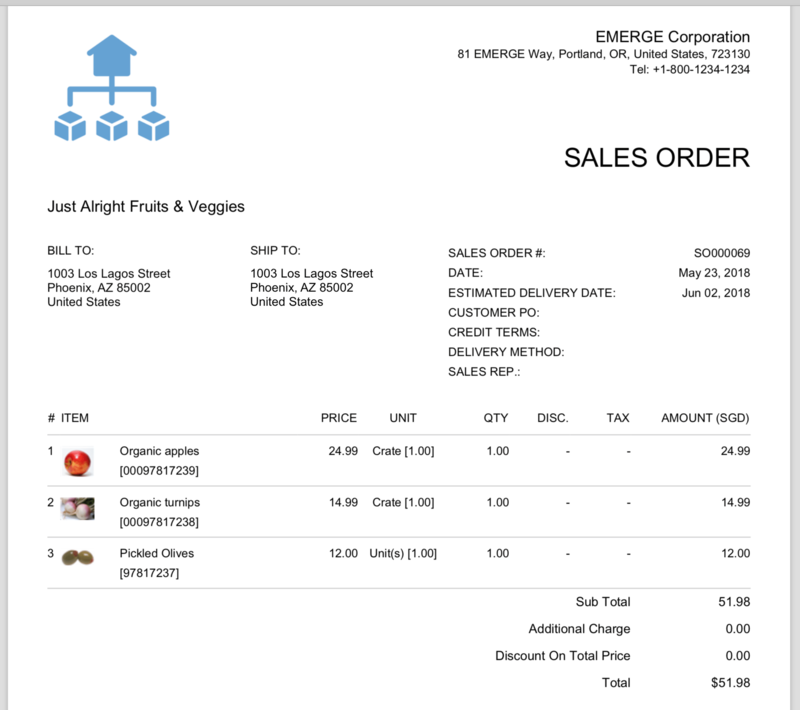 That very same sales order is automatically entered in EMERGE Cart without human intervention or manual data entry! Just have a look at that sales order listed in the Sales module. Its payment and shipping status is displayed as In Progress. 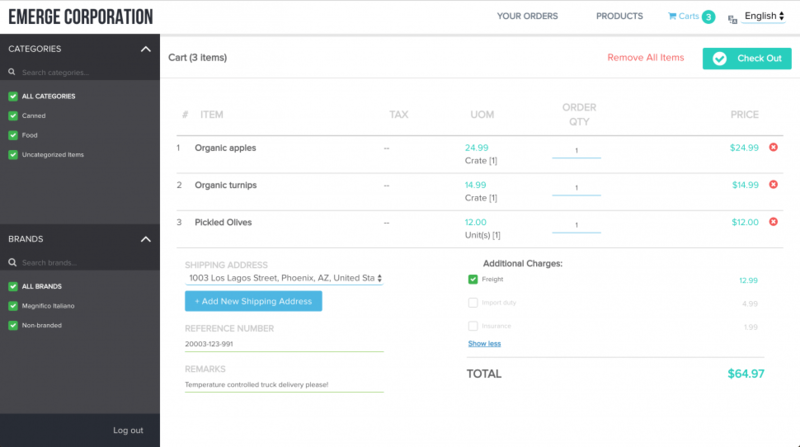 This is a real time-saver and probably the main reason why your customers like using a shopping cart for their purchases — easy checkout of orders in their own time and own pace. This is important if you’re dealing with customers in different time zones. 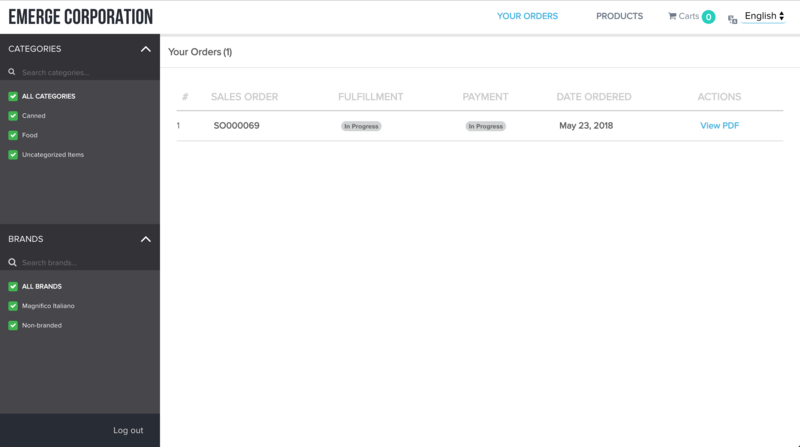 Clicking on the same sales order displays the nitty gritty details: the customer, shipping address, billing address, any remarks and a scrolling list of items contained in the sales order. It’s as if you had entered this order through other sales channels. Now it’s up to you to start packing all the items and generate a shipment! I’ve only scratched the surface of B2B for your business here. 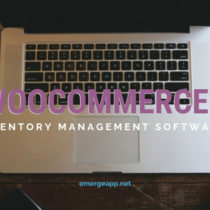 If you’re a traditional wholesaler or distributor looking for a B2B eCommerce platform but unsure how or where to start, then you have a ready solution with EMERGE Cart. You’ve seen how easy it is to create purchasing accounts for your best customers, how to customise the product catalog and price list for them, how they can checkout their purchases, and how you receive the sales orders directly in the web application. If you’re an existing of EMERGE App, great! EMERGE Cart is ready and waiting for you. 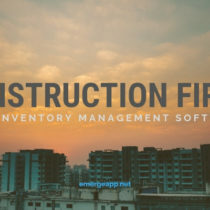 If you’re looking around for an order, purchase, and inventory management solution for your small business, and with a view to B2B eCommerce in the future, then why wait? Try EMERGE App for free and give it a spin.